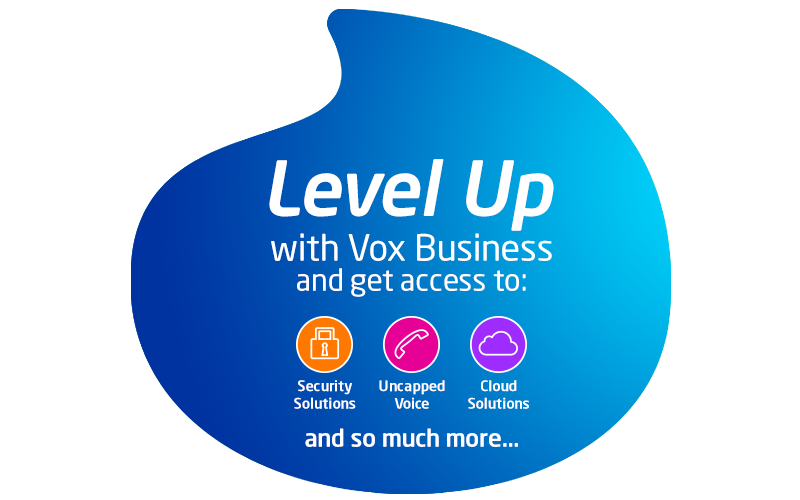 When you level up with Vox Fibre to the business (FTTB) your only limitation is your imagination. Work smart with Vox Fibre’s end-to-end fibre solution. Vox offers highly cost-effective fibre solutions with extensive coverage over our own purpose-built network. Reap significant savings by consolidating your voice, video and data over one connection. Whether you are an SME needing all-in-one voice and broadband data bundles, or a larger multi-site corporate needing a bespoke solution, our solutions allow for seamless scalability for all your application requirements. Our high-availability, low-latency network delivers future-proof capacity for all your requirements, and bandwidth can be upgraded as needed. We install a 1Gbps port, and offer capacity ranging from 10Mbps to 10Gbps. Our fibre network is underpinned by an established national and international backbone. With over 13 local Points of Presence (PoPs) and footprints in all the Teraco environments, our national ring provides unmatched resilience. Our international network runs over multiple cable systems, terminating in 2 separate PoPs in London. Why Choose Business Class Fibre from Vox? Vox is an integrated ICT and infrastructure partner to businesses and homes across South Africa. We provide an extensive range of communication, infrastructure and application services across a resilient national and international network. We are defined by our innovation, technical expertise and focus on customer service. These qualities underpin our ground-breaking fibre network that supports a diverse portfolio of broadband and dedicated solutions, ranging from 10Mbps to 10GBps, and meets the needs of any size business. How do I know if there is Business Class Fibre in my area? Fibre is available in Johannesburg, Cape Town, East London, Port Elizabeth, and Durban. Our aggressive rollout strategy ensures continued expansion. In instances where fibre is not yet available in your area, alternate solutions are available. Enquire on our website for alternatives or indicate we should let you know when fibre is coming to your area. What do I need to do to get Business Class Fibre for my Business? Check availability of fibre for your location or enquire on our website and a consultant will call your right back to discuss your requirements.